Just look at it. It makes no sense. What in blazes is a medieval castle doing in San Antonio, Texas? And yet there it is, one of my favorite post offices. 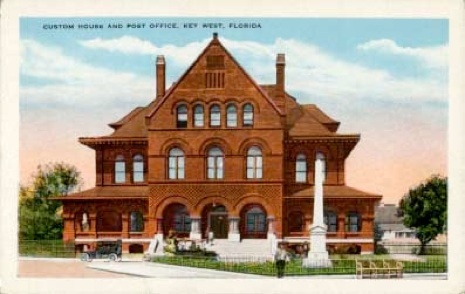 I love the Post Office and I love postcards, so it’s natural that I love postcards of post offices — post offices that look like castles, little post offices, post offices with awnings and palm trees, post offices rocked by earthquakes. Amen. But how do some post offices come to be castles? 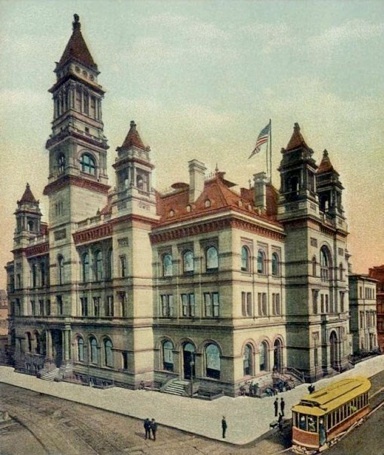 In James H. Bruns’ Great American Post Offices, he explains that the post office building was often the only significant Federal presence in a city, and the government wanted to make a statement. And, not surprisingly, U.S. Senators and Representatives wanted to spend Federal dollars in their district. The results were often impressive buildings resembling opulent townhouses, secular cathedrals or even fortresses. Huge towers did nothing to move the mail any faster, but they made the post office stand out. And for the architects that designed them, working and living on a government salary, the designs were an attempt to attract attention and build a reputation. There were four classes of post offices, and a building’s design was based on the population it would serve and its annual postal receipts. 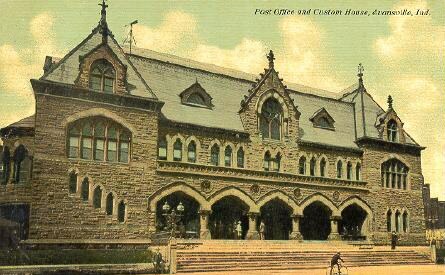 First class buildings qualified for marble or granite, second class for limestone or sandstone, third class for brick, and fourth class post offices, which served small towns, had to make do with wood or canvas. But brace yourself for a shock: If a Congressman had pull, his post office could be upgraded. When, for example, a Congressman came from a district with a quarry, the suggested use of brick was an affront. 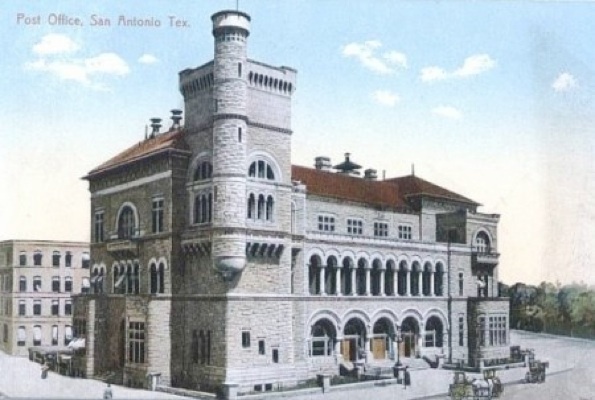 Thus postal castles were built all over the United States. 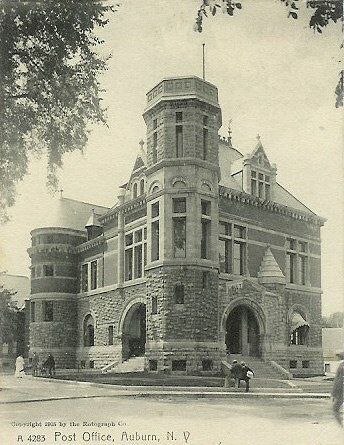 The Springfield, Missouri, post office was a three-story limestone castle with a four-story turret and a five-story tower. It took five years to complete, and housed a postal staff of one postmaster, one assistant postmaster, six clerks and seven letter carriers. 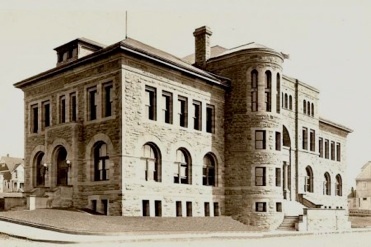 In Port Townsend, Washington, a massive sandstone, copper-roofed, Romanesque-style post office served a community of 2,000 persons. 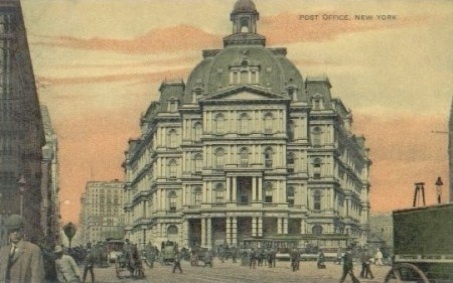 The old New York City Post Office, on Broadway, magnificently impractical, a Second Empire design by Alfred P. Mullett, whose tenure as Supervising Architect led to overwork, broken health, an unsuccessful lawsuit against the government, and suicide. Of his larger works, only his post office in St. Louis survives him. There are scores of views of this post office; I love this one for the color of the sky and the curious gentleman in the lower left-hand corner. 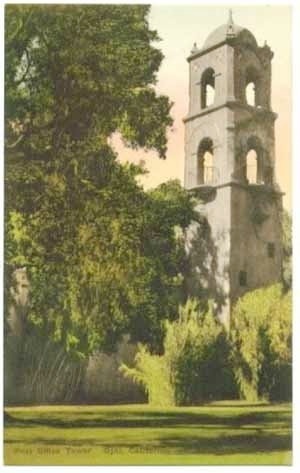 The tower of the Ojai, California, post office, whose hand-tinted postcard is a work of art on its own. The tower owes its existence to two men: Edward Libbey, owner of Libbey Glass, first visited Ojai in 1908. He eventually had a home built, and persuaded the city that it needed a cohesive architectural vision, which he would supply. He hired San Diego architect Richard S. Requa (1881-1941), who designed a Spanish-style arcade that would enclose the shops on Ojai Avenue, and include a campanile — a free-standing bell tower — that drew its inspiration from the campanile of the cathedral in Havana, Cuba, and from the Havana Post Office. Libbey paid for design and construction; the post office tower was built in 1916 and today it’s an Ojai landmark. 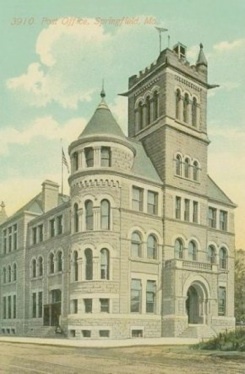 The French chateau post office of Evansville, Indiana, designed by William A. Potter and built in 1879, with buff limestone walls, brown sandstone trim, slate roofing and granite columns. 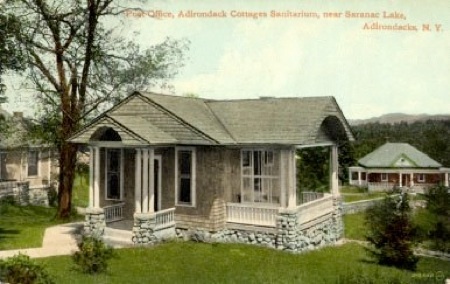 A dainty cabin with white porches at the Adirondack Cottages TB Sanitarium near Saranac Lake, New York, where, no doubt, letters were greatly appreciated. 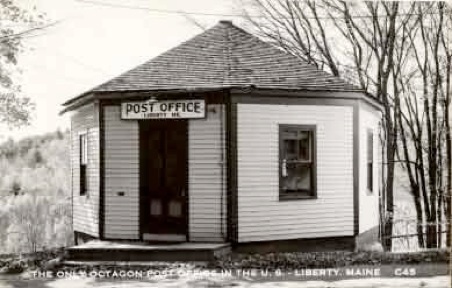 The octagonal post office in Liberty, Maine. 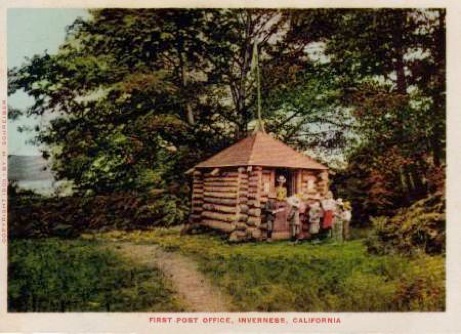 The log cabin post office of Inverness, California, circa 1908. … and its temporary quarters in a tent in Golden Gate Park. The red brick and stone of Key West, Florida. Far north in Washington, D.C., a dreamy William Freret designed it with fireplaces, prompting some heated reminders of its location. 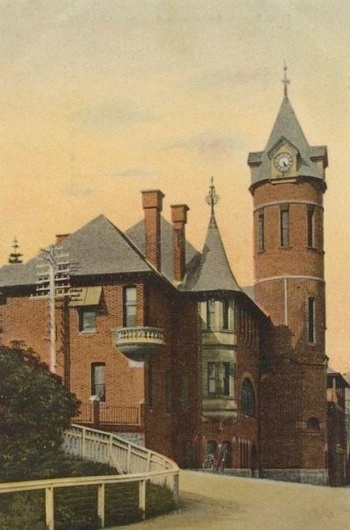 After delays in construction, it was completed in 1891. 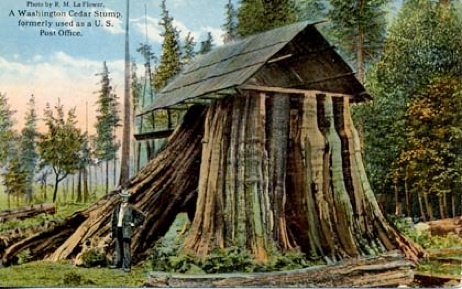 The gigantic cedar stump in Port Angeles, Washington, that served as a post office until 1905, with William McDonald, Postmaster. Also very organic, the thatched roof of the Eastnor post office in Herefordshire. I oft marvel at what people will do to get their mail, and in this photo by B.B. 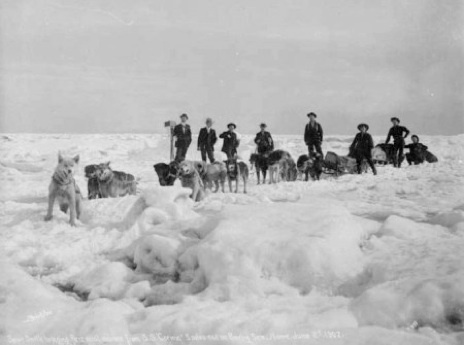 Dobbs we see Martin Victor “Sport” Smith, with his dogs and friends, bringing mail ashore from the S.S. Corwin on June 2, 1907. In this photo, Mr. Smith is five miles out on the ice of the Bering Sea, apparently as close to the shore as the Corwin could come. “It’s a fierce game, that carrying the mails in the winter,” he once observed. This summer run must have been a lark for him. 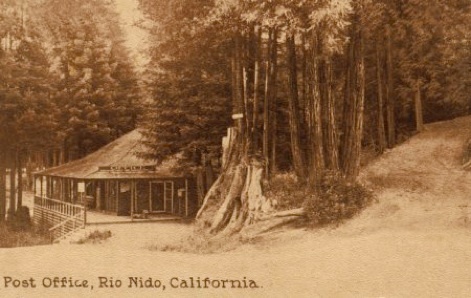 The post office in Rio Nido, California, a small settlement in the redwood canyons along the Russian River in Sonoma County, on a postcard mailed in the summer of 1914. If you squint, you might see the dog on the porch. For green ivy, awnings and a lovely lawn, it’s hard to beat Charleston, West Virginia. The Baltimore Post Office, built in the 1890s, was a towering presence, but an unbearable workplace. James H. Bruns, in Great American Post Offices (1998), notes that when the windows were open, drafts sickened the postal workers, and when the windows were closed, clouds of dust choked them. 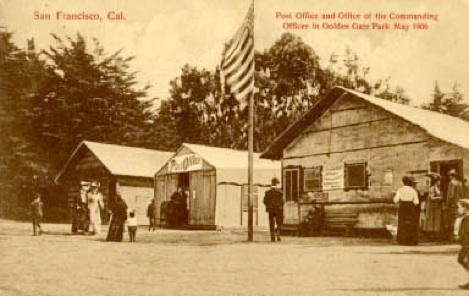 (The dust in these post offices contained dried manure from horse-drawn postal wagons, carried in on the mail sacks, with the odor of the stable. In post offices with overhead conveyors, a steady dusting of manure from the sacks fell upon the workers all day.) The Baltimore office’s main tower, although a landmark, was used only as a place to store old ledgers. 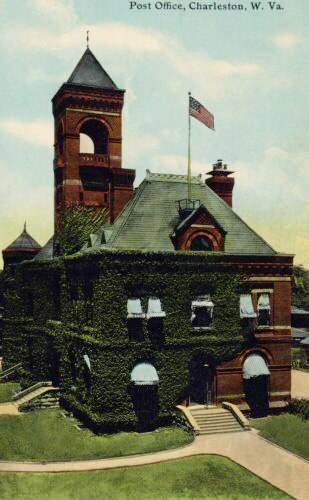 In 1892, in Pawtucket, Rhode Island, the U.S. Post Office purchased a triangular piece of land, on a slope no less; it fell to architect William Martin Akin to solve the puzzle, which he did with a domed, circular entrance pavilion. This Post Office opened in 1897. 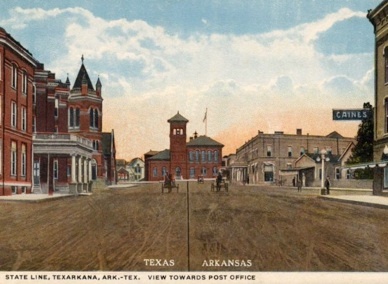 The Post Office in Texarkana straddled the Texas/Arkansas state line and thus you could mail a letter in two states at once. This was, of course, replaced by a faceless gray monolith which still straddles the line, but with less class. With the largest natural deep harbor in Western Australia, Albany was for many years the first port of call for mail coming from England. 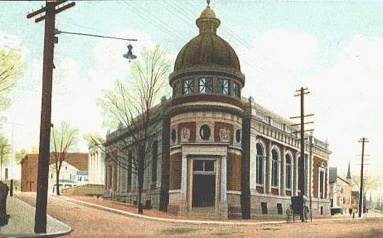 This photo, taken by Morgan circa 1910, shows the Albany Post Office where letters came to rest after their ocean journey. Ypres was an historic medieval town in Belgium that was “strategically placed” during World War I. Three battles were fought there; the German army started the second battle in April of 1915, but when they couldn’t take the town, they chose to demolish it with artillery. Their guns included a 17-inch howitzer firing shells of 1,719 pounds. It was said they came in “with a noise like a runaway tramcar on badly laid rails.” The gun was the legendary Big Bertha, made by Krupp and named for the heiress who inherited the firm in 1902. 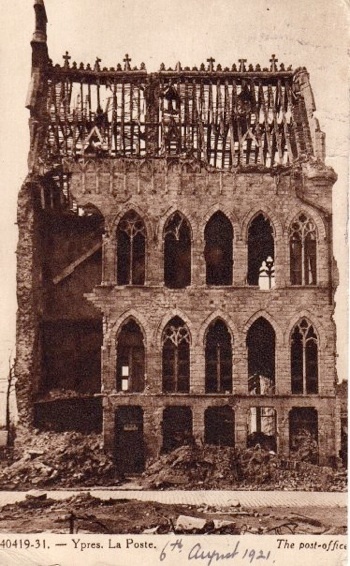 The post office in Ypres, shown in a postcard mailed to Yorkshire in 1921, was on the receiving end of the punishment. 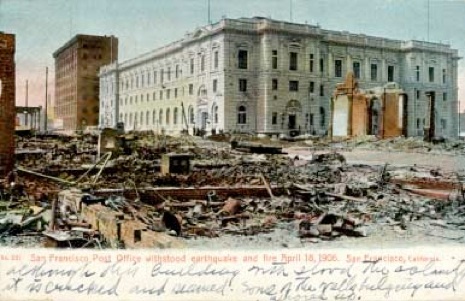 Most of the great old post offices are gone, torn down for more practical, modern, box-like structures that can accommodate things like central heating and air conditioning, telephones, automation and computers. But occasionally, a town doesn’t have the money or the influence to erect a new building, and a dinosaur survives. My wife and I saw such a miracle one day while driving through nearby Auburn, N.Y., in search of a shop selling a fireplace screen. Following written directions, reading street names aloud and watching for street signs, I blinked and there was one of my postcards come to life, a Mifflin Bell masterpiece of grandeur. Made me want to mail a letter. 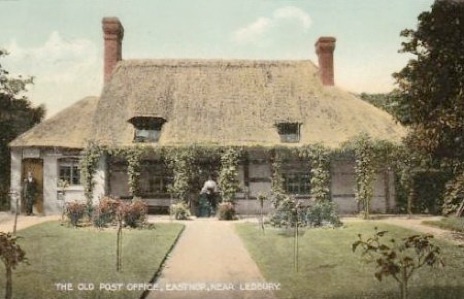 For many, many more post office postcards, do visit my blog devoted to the subject.